Well, there is only one catch, the giveaway begins THIS FRIDAY and is ONLY opened from 12:01 am and will close at 12:01am on Saturday, so it is only OPENED ONE DAY! 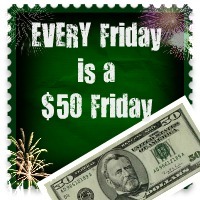 I know we ALL LOVE $50 Friday – well, this week there are TWO Groups (Group A & Group B) which means that if you are really lucky – you could WIN $100!!! You have to come back HERE on Friday and fill out the entry form! This will ONLY be OPENED for ONE DAY! Freebie Princess: Stick with Me, Get it Free!